It’s that time of the year again––when the term “fun-size” starts popping up in office candy bowls around the country along with boxes of orange-frosted doughnuts brought in by a well-meaning co-worker (thanks a lot, well-meaning co-worker!). But let’s face it––in the long run, those treats typically end up as more of a bodily trick. What’s a health-minded sweet tooth to do? Meet Chef Geo. He’s the culinary mastermind behind ProTreats (http://protreats.com/). Nice guy. And not just because he can whip up a batch of guilt-free and protein-rich sweet treats on the fly…although that definitely doesn’t hurt. Don’t believe us? Just check out his Instagram (https://instagram.com/protreats) page. See? 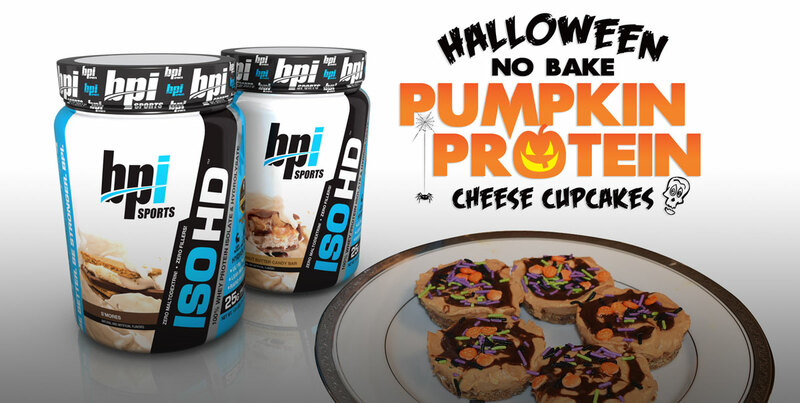 We’ve asked him to channel the Halloween spirit and make some spooky treats using our BPI S’mores ISO HD whey protein. It’s the purest form of protein we offer––and because it’s blended with hydrolysates, it’s easily digestible making that pesky whey bloat practically non-existent. Blend all of the above ingredients in a food processor and set aside. Add a spoonful of the base to each tin and press down with the bottom of a glass to flatten-out the base. In a food processor, blend all of the above ingredients until it reaches a smooth, creamy orange consistency. Pour the topping onto the cupcake base and place in freezer for 30 minutes to stiffen up before eating. Scrape some of the orange zest on top of each cupcake and decorate with your favorite Halloween sprinkles.